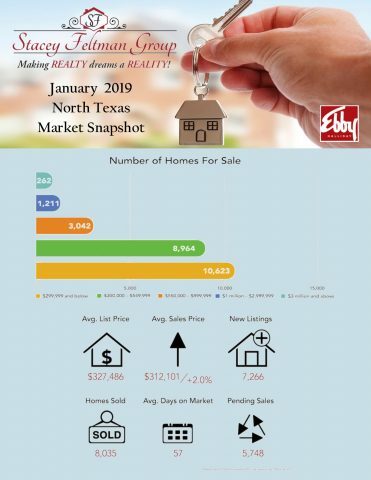 Curious how the North Texas housing market is performing? Take a look at the latest stats! We are so fortunate that the first realtor we contacted was Stacey Feltman. From the start I was totally at ease. It is a daunting task to search for 'that perfect home.' There are so many areas to cover and so many options to consider. Stacey's approach assisted us in the process of elimination and helped us focus on what was most important to us. Stacey was very patient and always stressed how important it was not to rush into making a decision. Her approach was that if you don't have that 'good feeling' when you walk into the home then move on ! And that worked perfectly for us as we finally did walk into a home and had that 'good feeling.' We did not hesitate that time and are now proud owners of a lovely house that we feel totally at home in. Stacey's experience guided us throughout the process, starting with the search and ending with the closing. The whole time I knew we were in good hands and that the right decisions were being made along the way ! Thank you Stacey !